Bowling Green native Corey Hart batted .299 with eight home runs and 18 RBI in 17 games between September and October. 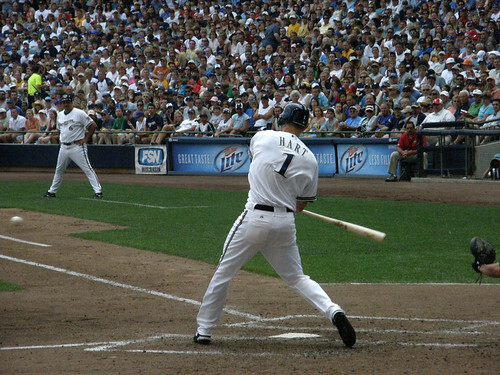 Hart also scored 23 runs, slugged .579 and boasted a .372 on-base percentage. Honorable Mention: Paul Laurence Dunbar alum A. J. Ellis batted .455 in 13 games for the Dodgers…Marlins second baseman Dan Uggla, born in Louisville, batted .289 with three home runs. Former UK right-handed pitcher Joe Blanton continued his second-half surge with a 3-0 record and 3.19 ERA in six starts. Blanton struck out 36 batters and walked 11 in 36 and two-third innings. Honorable Mention: Nationals reliever Tyler Clippard, born in Lexington, didn’t surrender an run and recorded two wins in 10 games…Braves reliever Jonny Venters, born in Pikeville, had a 2.13 ERA in 15 games…Former Morehead St. right-handed pitcher Jon Rauch was 1-0 with a 1.80 ERA in 12 games.